Much splashy fun and frolic was had at the Girl Scout Fall Rally last Saturday, Sept 9th, at Redland’s Egyptian-themed Splash Kingdom! The Splash Kingdom Waterpark is known to have some of the country’s most unique water attractions and was a great forum for family entertainment. It was also a unique venue to sample and preview the 2017 Fall products. This year’s theme is “Be Fearless!” and we had to be absolutely fearless to go on most of those wild water rides! The day started out with a line of Girl Scouts and their families, in full swimwear and gear, entering into the Pharaoh’s “pyramid.” I was with my Girl Scout buddy, Ivanna, and our daring moms. As soon as we entered the structure, we were greeted by a very friendly, life-sized superhero black cat who was waving all of us in. The fearless feline was the Fall Rally mascot this year and many of the 2017 fall product rewards are appropriately cat-themed. (I look forward to my personalized cat mypatchcreation this year!). After we got our wristbands checked, we ran past the indoor Big Air Trampoline Park to the outdoors, where we left our belongings and towels in an available cabana. We put our cameras and cell phones in the waterproof pouches (provided as part of our SWAG) and went straight to the 17,000 square foot Castaway Cove. We waded in as far as we could before the horn blew. The horn signaled the coming of ocean-like waves which began to crash into us. We each managed to get a clear floating tire and held on as we were thrown about (but in a relaxing kind of way). Water splashed in every direction and cooled many smiling girls from the warm sun. After the cove, we went to the assigned location for lunch. We were lucky because the line for lunch was short when we arrived, but got much longer as the day went by. 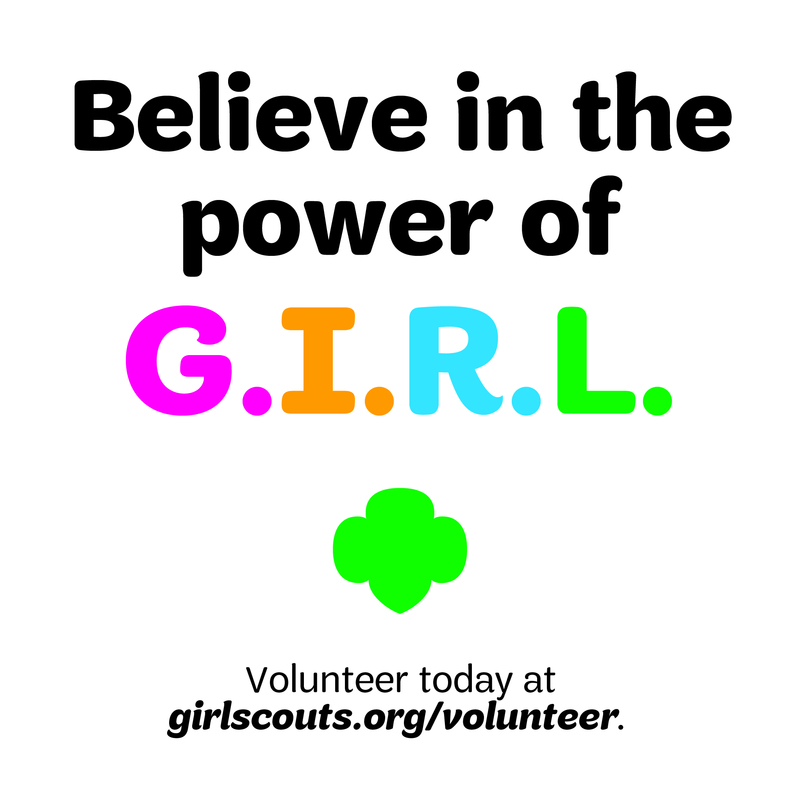 Girl Scout volunteers directed us to our selections for lunch which included a hamburger, hot dog, or grilled chicken sandwich; a bag of chips or a corn on the cob; and an ice cream sandwich or popsicle. We had forgotten to request a vegetarian option for me but I still enjoyed my corn on the cob, ice cream sandwich, my mom’s chips and pink lemonade. After lunch in our cabana, I ran through the water spouts and under the water-tipping bucket of Fantasy Island, until I realized the area was for “guests under 48 inches.” So then, we tried the RipTide Surf Pool – where we each got to ride a boogie board on a simulated wave. My first “ride” ended too quickly so they let me try again. Then, we grabbed some blue floating tires and got swept around the quarter of a mile, “Nile River.” The Nile was similar to a lazy river ride and we waved and chatted with a few of our Girl Scout friends for several “miles” as we went round and round under bridges and were drenched floating through waterfalls. We finally went over to the ominous looking Tower of Kings. They closed it for an hour but had just reopened it! The Tower of Kings is the tallest free-standing waterslide tower in the country and there are eight different waterslides which one can try after climbing up to the top of an extremely tall tower. Ivanna and I tried all of them a few times including the completely enclosed 90 foot tall pink slide, the Anileator, and the pitch black atmosphere of The Dark Chamber. We found the courage to also try Pharaoh’s Falls (which sent us falling down 70 feet of water) and the very scary Ramses’ Rocket (which sent us straight down 400 feet in less than 12 seconds). I wanted my mom to go on a ride with me so she finally and reluctantly climbed up the tower. When we got to the top, she took a quick peak down Ramses’ Rocket and said she was going to faint so we went down Pharaoh’s Revenge instead. This yellow slide was more of a fast rafting ride and what she said, “was fun and more age appropriate for my rickety old joints.” Meanwhile, Ivanna’s mom was very brave and adventurous and said that she wanted to try my favorite – the Wrath of Ra. The Wrath starts out with an enclosed pitch dark tunnel and then opens to the “outside” again with a 31 foot splashy drop. Ivanna and her mom climbed up the steep tower with me and they got on the dual person raft. My mother was at the bottom, getting ready to record the ride on Ivanna’s cell phone. Fortunately, Ivanna’s mom’s loud screams alerted her well ahead of time of their impending “arrival” and my mom was able to record their entire ride down. Ivanna’s mom felt very dizzy after the Wrath so we went to get some replenishment and much needed mom-recovery-time at the fall product tasting area. The product tasting tables were located near the trampoline area and samples of the 2017 Nuts and Candy selections were generously laid out for us to try. There were the Fruit Slices which were chewy, brightly colored, and not too sweet. There were also roasted Salt and Pepper Cashew Halves which were a nice treat and a new selection this year. Another new selection and my favorite, was the Dill Pickle Peanuts, which were tangy and crunchy. I also enjoyed the slightly spicy Salsa Mix and of course, the eternal classic, Mint Treasures. The Girl Scout volunteers near the tables reminded us that this year, as in the past, “there are more delicious options available online.” I look forward to ordering my Girl Scout Tins (full of mints) this year and adding to my collection of beautiful Girl Scout Tins from previous years. These unique tins are great for storage and once my brother and I eat all the mints, I use them to store a lot of my Girl Scout memorabilia and jewelry. We were lucky enough to take an amusing photo with Ms. Cynthia Breunig, the CEO and President of our San Gorgonio Council. She has a good sense of humor. She was also speaking with and giving each Scout who passed by a large, lovely patch. The patch has Ms. Breunig’s name on it with “a.k.a. Flamingo” on the right upper corner. The patch also depicts a pink flamingo with brown hiking boots and a hiking stick trekking through what appears to be a sun-filled desert landscape with a purple mountain in the background. Across the landscape are the words, “Make your own best life.” I think that is worthwhile advice for all of us to live by. 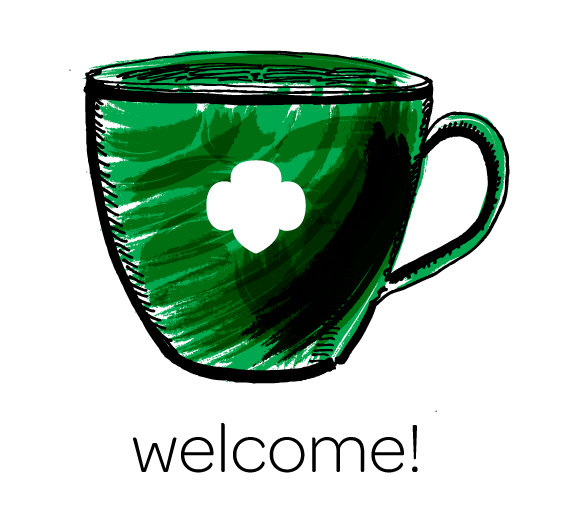 The Fall Rally was a fun experience for Girls Scouts, both young and old(er), and for me, it was a relaxing break from the start of a very tough homework-plagued high school year. As Ivanna said at the end of the day, “It was a great experience spending time with friends and enjoying the water!” In addition, all the Girl Scouts who attended were given an opportunity to become familiar with the Fall Sale products, to sample them, to see the rewards up close, and to start planning for a successful sales season. 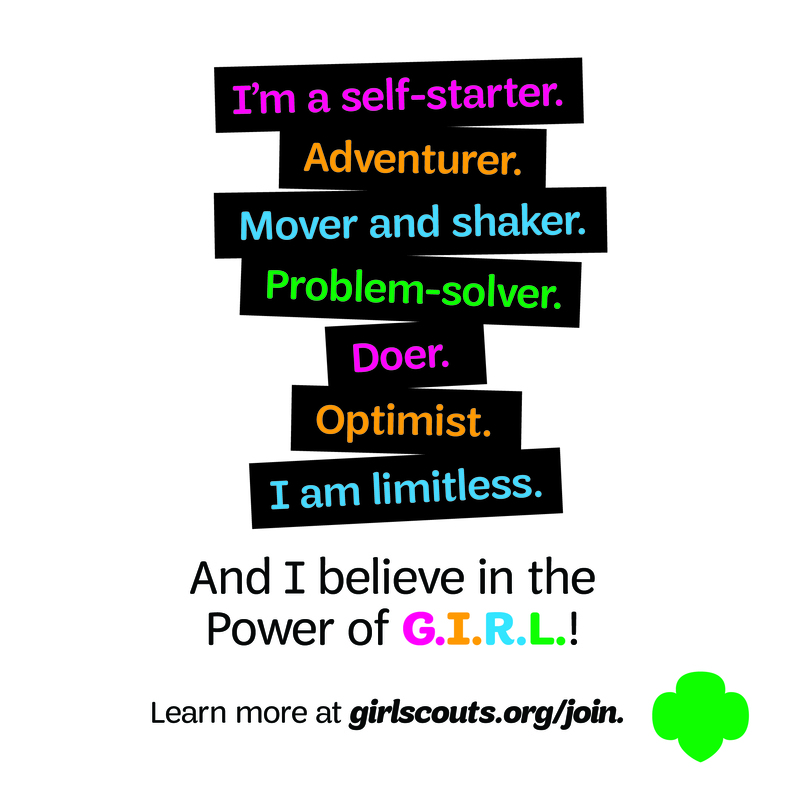 The Fall Product Sales season is an opportunity for each Girl Scout to become more enterprising and business savvy and to use the knowledge and experience to pursue her dreams whatever they may be. Pursuing one’s dreams definitely requires the type of fearlessness that propelled us down Ramses’ Rocket. It is never too early or too late to unleash the hero inside! Great job again, Nesha! Funny and well-written! Bravo!